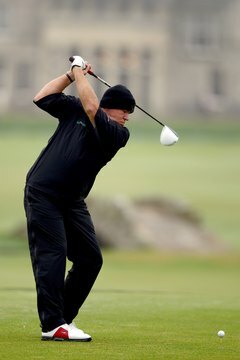 John Daly can achieve swing speeds over 130 mph. Golf club head speed is the biggest determinant of how far a golf ball will travel. Many golf professionals are able to generate high club speeds through their form and method of striking the ball. Although the optimum method to measure golf club speed is through using technology at a golf training or practice facility, many golfers do not have the access or money to have their club speed measured. If you need to purchase new golf clubs or other related equipment, however, you can estimate the golf club speed. Hit 20 golf balls with your driver at your local practice range and record the distance the drives carried. Discount any drives that you mishit significantly. Add the drive totals together and divide by the total number to get the average drive distance. Subtract a “roll factor” from the drive average to determine the distance of carry for your drives. A common factor that you can use for this part of the calculation is to subtract 5 percent of the drive average. Divide the distance by 1.75, which will provide the ball speed at impact. If you carry the ball 230 yards in the air, the ball speed will be just over 130 miles per hour. Divide the ball speed by 1.5 to get the estimated swing speed for your drive. Alternatively, you can divide the carry distance by 2.3 to estimate the swing speed at impact, but the result will not be as accurate. Golf: Which Shaft Flex Is Right for You?